Say it all without saying a word. A fragrance of seduction that goes beyond words! A composition of contrasts in which the effusive note of the Himalayan Blue Poppy embraces the enchanting scent of the Datura flower. Around this duo, white flowers mingle gaily with yellow flowers...in Poême each word is a flower, each flower a poem to express that which cannot be said. An oriental fragrance of light and shadow, Poême excels in the art of contrast. 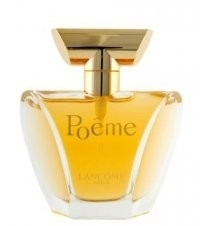 Frosty or sunny, blues or yellows, excited or composed, the notes of Poême form a poetic olfactory sensation. This scent is a little overpowering for me and I just don't like the strong floral scent. The bottle and scent is a little old fashioned In my opinion and the price is expensive. Created in 1995 by Jacques Cavallier. Heavier bold floral scent. Very strong projection and longevity and very wearable. "This scent is a little overpowering for me and I just don't like the strong floral scent. The bottle and scent is a little old..."